Alumnus Cody Fagley’s foundational cybersecurity company, Codeus Tech, is incubated at Laramie’s Wyoming Technology Business Center. 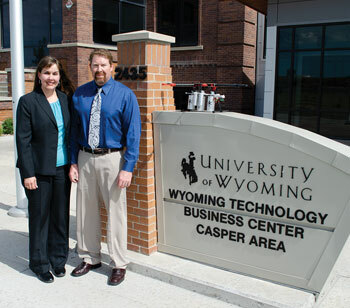 Thanks to UW, Wyoming businesses are getting the help they need to succeed. 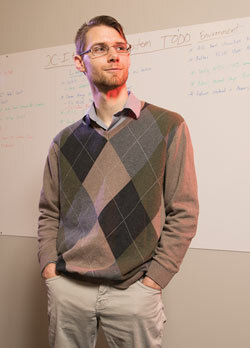 Recent alumnus Cody Fagley wants to change the world—the world of computers, that is, where most Americans spend the majority of their workdays. His foundational cybersecurity company, Codeus Tech, is currently incubated in the University of Wyoming’s Wyoming Technology Business Center (WTBC) on the UW campus. However, the university doesn’t just help Laramie entrepreneurs. Affiliated programs work with businesses and potential businesses across the state, such as Aerial Enforcement Solutions in Casper, a startup company that will produce drone platforms for use by law enforcement and firefighting; and Old Army Records in Sheridan, a startup that compiles and disseminates information on a full range of 19th century U.S. military topics. How could this change the world? “In our perfect world, long term, we won’t have any Windows or Linux computers anymore. We’ll replace them outright. We won’t have dynamic random-access memory in our computers. That’s our long-term goal,” says Fagley, who grew up in Basin and went to high school in Powell. WTBC Director David Bohling has helped Fagley at every step. “Codeus is carving out an entirely new way to approach operating systems and security—the security being the original catalyst for the concept,” Bohling says. He also gives credit to computer science Professor Ruben Gamboa, who sent him to a conference that helped inspire Codeus. The company currently employs a handful of people but is seeking government grants to grow. Fagley—who also participated in UW’s $30K Ellbogen Entrepreneurship Competition, now the John P. Ellbogen $50K Entrepreneurship Competition—wants to keep Codeus in Wyoming and contribute to the state’s economy. He loves the outdoor lifestyle here. In Casper, Nicol Kramer was driving her kids to school one day when she heard about the WTBC’s 2017 Casper Start-Up Challenge. Her husband, Todd, had been tinkering with a company idea for a while, but financing it from their own budget was limiting. That night, after the kids went to bed, they entered the contest and went on to become finalists. Aerial Enforcement Solutions won seed money and is now incubated in the WTBC Casper-Area Incubator. “It’s been a great resource,” Todd says. He notes great feedback from business leaders and information from the Wyoming Technology Transfer and Research Products Center that helped them seek a more rigid patent. Their AirGhost product fits in well with tremendous growth of drone use by law enforcement, and AirGhost also has potential for use in firefighting, the military and pest control. 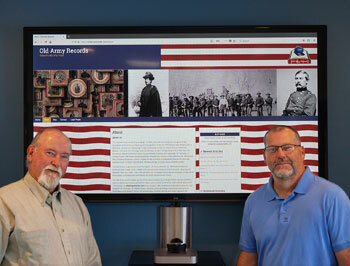 In 1992, Kevin O’Dell, a college student from Sheridan, and Jim Powers, a former aviation mechanic from Chicago, met at an archaeological dig at Fort Phil Kearny State Historic Site near Banner and discovered a shared passion for history—especially 19th century U.S. military history. Their friendship and work continued, and in 2004 an idea for a business formed when they were working on an archaeological survey of the Fetterman Battlefield and were in need of accurate primary documentation to be able to place the artifacts they were finding in the correct historical context. Internet information was sparse and sometimes contradictory, forcing them to seek out original government documents from sources including the National Archives in Washington, D.C. They currently update the website biweekly with articles on a variety of old Army subjects taken from records in their collection. The subscription database application, offering a dataset of about 14,000 general court martial cases, will come online in early 2019. The WTBC is part of the University of Wyoming’s mission to provide education and support to business startups throughout the state. Facilities in Laramie, Casper and Sheridan offer lab, office and conference room space for clients, and clients also receive counseling to help their companies grow larger and faster than they would otherwise. In addition, a statewide networking group, e2e, works to improve the startup climate in Wyoming. “We try to bring high-level mentoring to our clients, whoever they are and wherever they come from,” Bohling says. Each WTBC incubator hosts a startup challenge. The Casper Start-Up Challenge and Sheridan Start-Up Challenge each provide a $50,000 seed fund incentive as well as business support. Finalists work closely with WTBC staff to develop their business ideas. All finalists gain business process knowledge as they progress through the phases of competition, regardless of the competition outcome. The top three finalists each receive $5,000 and are eligible to access the $50,000 seed fund. The Fisher Innovation Launchpad (previously the Fisher Innovation Challenge) in Laramie is supported through the generous financial gift of Donne Fisher and matched by the UW Office of Research and Economic Development. It seeks to catalyze Wyoming technology startup businesses and provide the opportunity for them to apply for seed money to take the business past concept stage and into real-world first-article builds and initial sales. The competition identifies finalists who are eligible to pitch for the chance to apply to the $125,000 seed fund. All teams must each include a UW student, graduate student or post-doc. Before the Fisher fund, Laramie had 40 to 50 tech companies establish organically, Bohling says. “In the last three years with Fisher, we’ve generated 22 more,” he says, adding that Casper has already generated eight new businesses with its challenge and Sheridan three. To learn more, visit uwyo.edu/wtbc.